When you are a grown-up man and a Daddy to children of your own, one sure way to make your wifey melt is to sit, snuggled up with your kiddos and tell them made-up stories all your own. I know from experience. There are more, but of course, my old brain is having trouble recalling them. It's one of my favorite things to see: you and Daddy all snuggled up, him telling you a story and you listening so attentively. I like the fact that you have to use your imagination to illustrate his stories. And the teacher in me likes the fact that you are listening and can retell them, too. Great comprehension stuff, but that's boring. 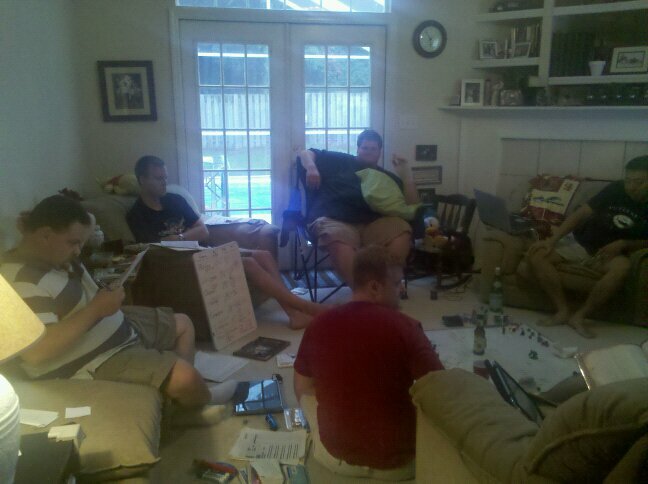 Daddy and his friends playing D and D last summer. I am pretty sure, though, that Daddy has an ulterior motive in these stories. 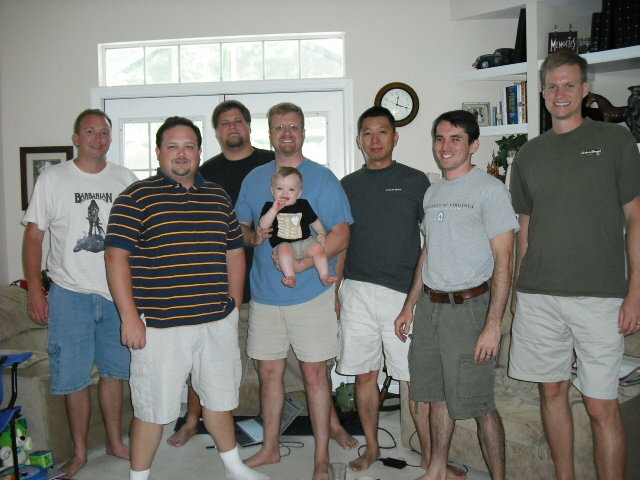 You see, one of Daddy's favorite hobbies is getting together with his friends and playing Dungeons and Dragons. It's this dice rolling, math doing, story telling game of geeks (although I love them dearly, those boys are geeky), and it makes up a big part of your Daddy's childhood and now even his grown-up-hood. Some of the people he plays with have been part of his D and D group since Daddy was a teenager. Uncle Kurt and Uncle Ryan play too, and they have been playing with Daddy since they were only a few years older than you. I know that Daddy cant wait until the day that the two of you roll up a character for you and you join in the fun. And no, I don't mind that at all. You see, at first, when Daddy and I were dating and he told me about all this, I had reservations. To be totally honest, I thought he was a little nuts. But then, as I watched sessions (after session, after session), I got to realize just how COMPLEX and cerebral these little gatherings were. First there's the math: dice of all size, shape and range rule D and D. Each roll represents something, and you have to add, multiply and Lord know what else to understand and play this little game. Mommy is terrified of the math part, so moving right along. Then there's the language and literacy component of D and D. As a Dungeon Master (did I REALLY just type that? ), or guide of the group if you will, you have to paint a rich description of what each player is doing and what they see. Your vocabulary has to be enormous and imaginative in order for the whole "world" of the game to exist. As a player, you have to understand these words, comprehend their meaning and then use them to act out your part of the puzzle. What some might consider nerdiness is actually mental Olympics. And there are worse things for you to be doing with your time. Look at the group that Daddy plays with: There's Mike, for whom English is really his second language DM'ing the thing, and he's a dad to two girls, a computer guru and helped his family run a business. Then Uncle Kurt and Uncle Ryan who both work with computers; Uncle Kurt is a second tier support person for Hayes Technical Support and Engineering, and Uncle Ryan writes code and is VP at Paul Consulting. Seth is now an honor graduate from law school at UVA and a former policeman. John is the Head of the Pediatric ER at a hospital in Lubbock, Texas, and Jeff is an archeologist and all-around ancient civilizations master. And Daddy. Daddy is a brilliant code writer and VP at his work. See? They may play a "geek game," but these guys are all incredibly smart, and even socially with-it. They are all happily married, most with kids of their own, successful and happy. I'm sure Daddy is going to read this and correct all my thoughts on D and D, but this is how I see it. And I am actually looking forward to you joining in all of this. One day, I hope to have another bunch of boys crowded around in my living room, eating pizza, drinking Mountain Dew and delved in a rich world of fantasy and math. And with these Daddy Stories, it's already starting.